Sending information to clients has never been more important than it is today, and within SALONBase we have both Email and SMS functions to keep in contact with clients. 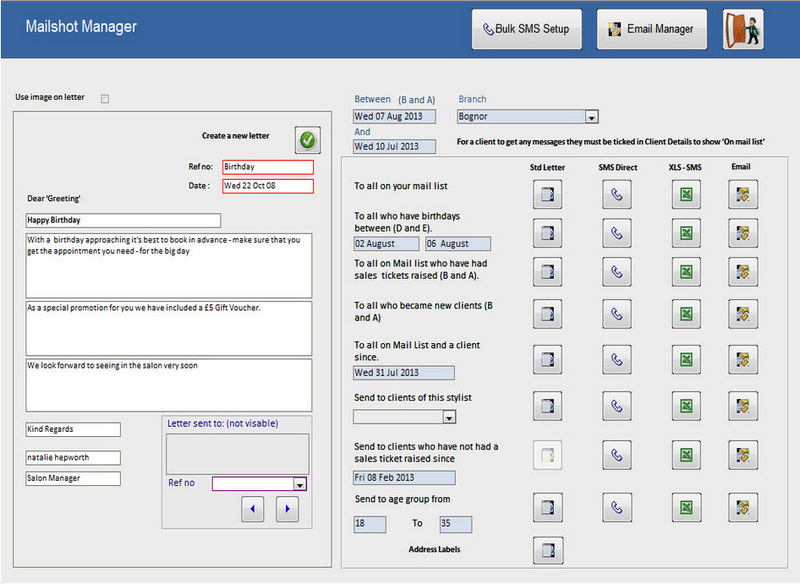 The email functon will create a list of emails which you can then pass on to a third party software such as SendBlaster. SendBlaster or similar software are dedicated systems to ensure that your emails are sent out and allow you to create newsletters etc. SALONBase also features a conventional mailshot facility allowing you to send standard letters to your Clients. The mailshot facility is easy to use, with letters quickly constructed by entering the contents into pre-set paragraph boxes. The purpose of the mailshot facility is similar to the SMS function and you can choose intended recipients based upon their status, history, or buying activity.